Intel has been strongarmed by ARM Holdings, the British RISC processor architecture company that is behind the design of CPUs and GPUs currently delivering the performance of our smartphones and tablets on a fraction of Intel processors' power consumption. The chip giant knows it missed the boat so far, and is aiming to quickly catch up. CEO Paul Otellini already announced retirement plans, which many argue had to do with the new mobile realities that Intel is completely missing out on, and now Intel is buying ARM-based designs outright. The company just spent $50 million in total to acquire engineers, assets an intellectual property from ZiiLABS, a wholly owned subsidiary of Creative, the guys behind the famous SoundBlaster cards of recent memory. 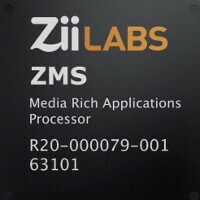 The interesting thing about ZiiLABS is that they are an ARM licensee, and have a ZMX-40 creation based on a 1.5 GHz quad-core Cortex-A9 CPU for Android, like the one we have in the Snapdragon S4 Pro, but combined with 96 of ZiiLABS' patented StemCell media processing cores. The company went as far as calling a 100-core mobile processor earlier this year when introduced, and the chip design was fully optimized with Android 4.0 ICS in mind at the time. This 96-core GPU tech is what Intel is apparently interested in, and we fully expect the move to boost Chipzilla's mobile processors in the graphics department going forward, so the next edition of Motorola RAZR i might shape up to be pretty interesting. Daniel.P $50, wasn't that a mistake? Why did they not buy it....? This amount of CPU and GPU, I believe would be used in what...? "The company just spent $50 in total to acquire engineers.." off course a mistake. The answer lies there up in the headline. By the way, i didn't know Creative had this kind of industry with them...nice. Why don't you just call me a chicken and ask me which came first: the chicken or The egg!!!!!!!!!! tethat is a stupid question... its the chicken... why do you think God created adam as a fetus? he created him as a man! why chicken? easy, do you think the egg will hatch if the chicken wont sit on it?! 96core GPU. Go home Intel, you are drunk. i dont think its a a15 base chip.. coz qualcomm is making its own SoC base on a9! and it has its own GPU the adreno... its not using the GPU like mali-400 that the exynos is using... qualcomm's snapdragon is like apple Axx chips!